Hose Assemblies are usually connected at both ends in service. They may then either remain in a fixed, or static configuration or in a flexing, or dynamic configuration. Whether static or dynamic, the First Rule concerning the configuration of the hose is that the bend radius of the hose must never be less than the Minimum Bend Radius (MBR) for the hose as listed in the relevant hose brochure. The most common situation when this is likely to occur is when the hose is flexed at the end fitting, with stress being applied to the hose at an angle to the axis of the end fitting. Typically, this happens either because the length of the hose is too short, or because the weight of the hose plus contents creates a stress at an angle to the end fitting. 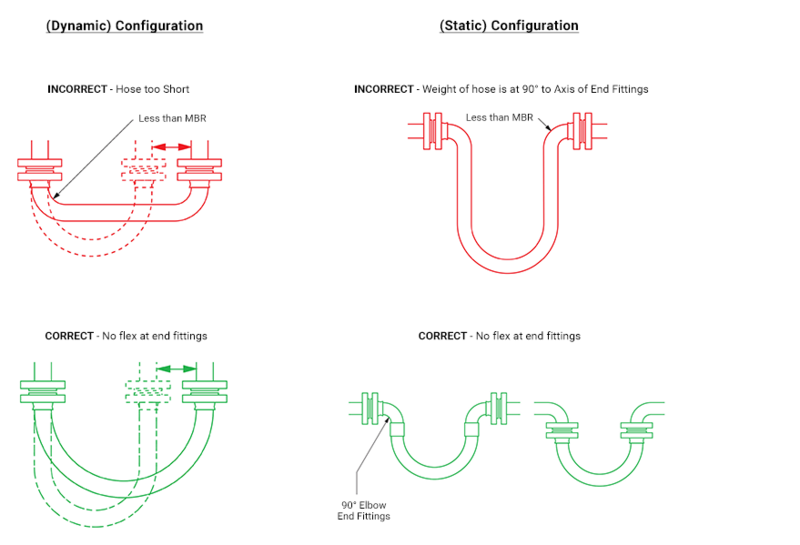 The Second Rule, therefore, if possible, is to design the configuration to ensure that any flexing in the hose takes place away from the end fittings.